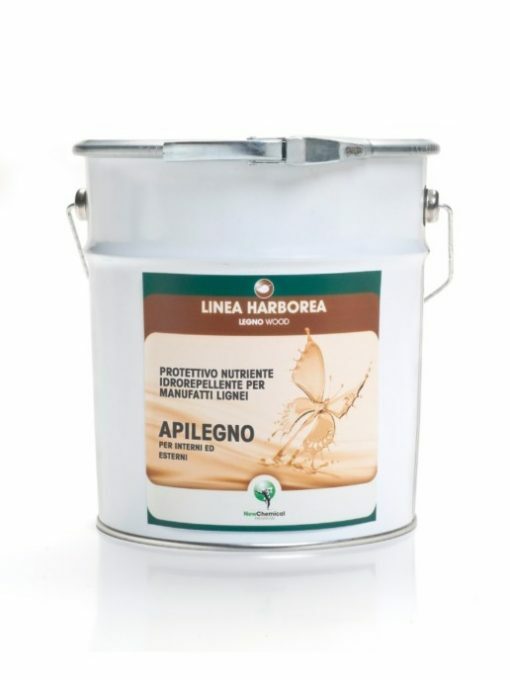 APILEGNO protects wooden surfaces from weathering and from mould and fungi. Suitable both for interiors and exteriors, it gives a waxed satin-finish, enhancing the natural beauty. It can be used on untreated wood and as a special maintenance treatment. Colours available apart from neutral: white, green, golden oak, larch, teak, chestnut, mahogany and walnut. Linseed oil, beeswax, propolis, wax-resin dispersions, essences, UV filters, self-levelling agents, water. the combination of the various components contained in the formulation, it gives a warm and soft finish at the same time. 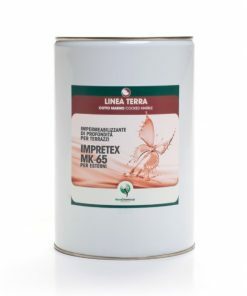 Mix before and during use. In colored version make sure that there isn’t the deposit on the bottom. Always use at temperatures above +10°C. When the surface is clean and dry (and if necessary after the preventive woodworm treatment) apply 2-3 coats of APILEGNO with a paintbrush. Wait for at least 2 hours between applications; if required, sand with fine sandpaper to smooth the surface. To treat larger surfaces it may be sprayed on. In this case wear suitable clothing for personal protection. In the event of dipping application it can also be diluted in water in various proportions, but it any case no more than 50%. 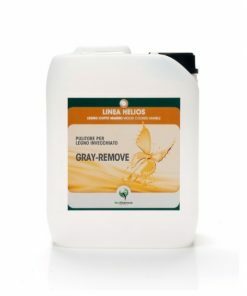 It can be used as a reinforcement over other types of primers (after removing loose parts from the surface). After treatment protect from the water for at least 24 hours. Always run some test applications before applying it to the definitive surfaces. No risk for the operator. It does not release harmful substances during application or after. Superior resistance compared to normal primers. Excellent protection with just two coats. Prevents the formation of mould keeping the item healthy. 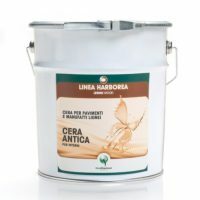 It is a unique product that acts both as a primer and as a finishing treatment. YIELD: Approximately 10-20 sqm/l per coat. HOW TO CLEAN EQUIPMENT: Wash with soap and water. AVAILABLE COLOURS: Neutral, walnut, golden oak, chestnut, teak, mahogany, green and white. VOC (Directive 2004/42/EC) : Interior/exterior trim varnishes and wood stains. The product is not classified as hazardous pursuant to the provisions set forth in EC Regulation 1272/2008 (CLP) (and subsequent amendments and supplements). The product is classified as hazardous pursuant to the provisions set forth in Directives 67/548/EEC and 1999/45/EC (and subsequent amendments and supplements). The product thus requires a safety datasheet that complies with the provisions of EC Regulation 1907/2006 and subsequent amendments. Any additional information concerning the risks for health and/or the environment are given in sections 11 and 12 of MSDS. idrossifenil)propionil-ω- 3-(3-(2H benzotriazol-2-i l)-5- terz-butil-4-idrossifenil)propionilos May produce an allergic reaction.